Every Blind Foundation guide dog gives people who are blind or have low vision freedom and independence. They allow people to get around safely and confidently. They also make wonderful companions. The Blind Foundation carefully trains its dogs so they can negotiate common hazards like traffic with ease. They also learn to take the unexpected in their stride, and to travel on buses and trains with confidence. Intelligent and friendly, guide dogs will learn where their handler (a person who is blind or has low vision) regularly goes. That way they can confidently lead the person with little direction. A guide dog can lead their handler anywhere. Workplaces, bus stops or shops, even planes and restaurants – a guide dog can ‘access all areas’. Or you can find out more in our guide dogs section. The Blind Foundation has been breeding and training dogs since the 1970s. As a result, we have a world-class breeding programme at our internationally accredited Blind Foundation Guide Dog centre. A puppy’s training starts when they are just eight weeks old. Each year up to 120 wee puppies are placed in homes of Puppy Raisers. These dedicated volunteers provide the young pups with their first family home, socialise them and help them develop confidence. After about a year, the pups return to the Blind Foundation’s Guide Dog centre, where they start the formal part of their training. The intensive formal training teaches the puppy all they need to know to become a world-class guide dog. From negotiating busy roads and footpaths, to getting on and off a bus or train. It takes up to two years to develop a guide dog. Before any dog can be partnered with a blind person, they have to pass a lot of tests – to make sure they’re the best of the best. 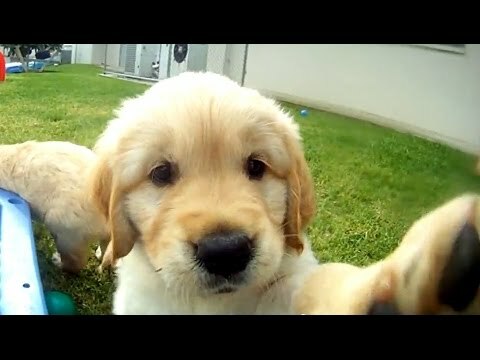 To find out more about how Blind Foundation Guide Dog puppies are trained, check out this video. Once a guide dog has passed all of the training tests, the Blind Foundation’s expert team learn about each dog’s personal characteristics. If you have applied for a guide dog, we find out about you too. We need to make sure you and the guide dog will be a good match, so the dog fits with your needs and lifestyle. If you’re a busy person with a city job, you need an active, outgoing dog. Someone living a quiet life in a small town will want a more relaxed dog. Our team also look at things like how fast you walk and whether you’ve got a big family. The team stays on board after we match you with your dog, to ensure you work well together. We can also provide extra training if your guide dog needs it. Sometimes, even with the law on your side you may encounter discrimination or barriers as a result of being blind or having low vision, that stops you from exercising your rights. The law and Guide Dog Services are on your side! Blind Foundation Guide Dogs are legally allowed to access all public spaces and buildings, and use public transport. All guide dogs are given their own ID card and identification medallion so that any organisation can verify their right to enter. However, Guide Dogs are easily recognised by their working harness and are generally welcomed wherever they go. The laws that protect guide dog handlers. As a Guide Dog Handler, it is important you understand your rights so you know what a reasonable expectation is and how you can ensure your needs are met. Knowing there are laws, policies and practices in place to protect you and your guide dog will ensure you can speak up if you feel you are being treated unfairly. United Nations Convention on the Rights of Persons with Disabilities (UNCRPD). Article 9 recognises accessibility as a basic human right, including full participation in all aspects of life on an equal basis with others. This includes access to facilities and services such as buildings, transportation, and indoor and outdoor facilities. New Zealand has ratified the UNCRPD and policies and practices should be implemented. The Human Rights Act 1993. This protects guide dog users from being discriminated against (when a person is treated unfairly or unfavourably than another person in the same or similar circumstances). The Act prohibits grounds of discrimination, which includes the reliance on a guide dog, wheelchair or other remedial means. The Dog Control Act 1996. This sets out that any disability assist dog [KR1] accompanying and assisting a person with a disability, or accompanying a person genuinely engaged in training, may enter and remain in any public place. However, the person must comply with any reasonable conditions imposed by the owner/occupier of the premises or place in relation to the entry or presence of the dog. You must not take your guide dog to the zoo due to the stress it may cause to both the guide dog and the zoo animals. Some wards in hospitals, such as the burns ward, are unsuitable for a Guide Dog to visit. When planning to visit a Marae it is a courtesy to clear with the Tangata Whenua for a guide dog to be present when visiting their Marae. Several Department of Conservation (DOC) reserves also restrict access to guide dogs. Please check with the local DOC office prior to entering restricted areas. Apart from these few restrictions, Guide Dogs have the right to accompany their handler anywhere. These rights are outlined in the Human Rights Act 1993 and the Dog Control Act 1996. Always ensure your dog wears its medallion. This medallion carries a unique number and identifies your dog as having been trained and certified by Guide Dog Services. Carry your Guide Dog Handler ID card where you can access it quickly. The Guide Dog Handler ID card is issued by Guide Dog Services when you receive your first or new Guide Dog. It is a plastic card similar to a credit or eftpos card and includes the dog’s identification number, the same as on the medallion. It includes a photo of you with your guide dog, alongside a description of the dog’s colour and breed. The passport is signed and dated by the Manager of Guide Dog Services and includes a contact number for Guide Dog Services. The reverse of the card has the relevant sections of the Human Rights Act 1993 and Dog Control Act 1996. These are the laws which entitle working guide dogs, and guide dogs, in training, with access. The card also states that refusal of access and discrimination against a guide dog and their handler may be a breach of the Human Rights Act and/or the Dog Control Act and can result in a fine or imprisonment. Domestic airline travel in New Zealand. Your guide dog can travel with you. Inform the airline when you are booking and the airline will allocate a seat and leave the seat next to you empty allowing you space for your dog. You cannot be charged for the extra seat. Policies and booking requirements and check-in times vary amongst airlines – check these when booking. Identify and clarify the nature of the barrier – accessibility difficulties are usually a result of being told that your guide dog is not permitted. Ensure you clarify the situation – e.g. if you are offered restricted access by being asked to sit at an outside table at a cafe, this may be because there are no vacant tables inside. Ask to speak to a manager/supervisor – if you are still not granted access, ask to speak to a manager. Show them your handler’s ID card and invite them to call Guide Dog Services, 09 269 0400 – the number is on the card too. Alternatively give them a call yourself and ask your guide dog instructor to talk to the person refusing access. Call the police – you are within your rights to do this. Taking one or more of these steps usually ensures that you and your guide dog are given access, accompanied by an apology. But if the issue is still not resolved, we recommend making a formal complaint. To assist you to resolve a complaint about a health or disability service.